Elegant product design: Otto's O.F.B. gas grill combines maximum functionality with sleek and innovative product design. It is a true quality product made in Germany. Enough room for all cuts: The spacious cast iron grill grate offers enough room for all common beef cuts, even for the biggest Porterhouse or Tomahawk steak. So that you can feed all your friends. The grill grate is also available in stainless steel in our shop. Two burners: The two infrared gas burners can be adjusted separately. After only 3 minutes of pre-heating the burners reach temperatures of over 900˚C/1500˚F. Like this, your steak gets a nice crust from the outside while its center remains tender and juicy. Otto’s O.F.B. works on propane gas and is certified for outdoor use. Removable top for easy cleaning: The top unit of Otto's O.F.B. is removable, so that you can easily take it off by opening the buckles at the back of the grill. This way you can easily clean the grill from the inside. To make cleaning the grill as easy as possible, Otto designed a moving drip tray, which minimizes fat splashes inside the grill. An extricable heat shield protects the table from the infrared heat and dropping meat juices. Both pieces can be washed in the dish washer after use. The height of the grill grate can be adjusted precisely and flexibly using the lever. This makes the grill particularly versatile and you can also use it to grill pizza, fish or vegetables. The secret behind a perfect steak lies in the right temperature. After only a few minutes of preheating, Otto’s O.F.B. reaches temperatures of over 900°C. At these high temperatures, your steak gets a delicious crust from the outside (Maillard reaction), while remaining tender and moist from the inside. With Otto’s O.F.B. you produce steak results that cannot be replicated with any other cooking method. O.F.B. stands for Over-Fired Broiler, meaning that the heat comes from above. At the core of Otto’s O.F.B. are two infrared gas units, emitting their heat from the top. This ensures an even distribution of the heat on the meat’s surface – as opposed to conventional bottom heat, where dropping meat juices and fat disturb the heat distribution. 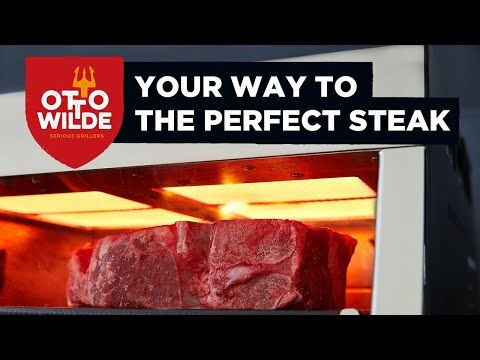 Thanks to this innovative technology, your steak will be ready within a few minutes – including the pre-heating time. The two gas units are separately and stagelessly adjustable, making the O.F.B. an incredibly versatile grill: Next to steak, the O.F.B. is also perfect for grilling vegetables, fish and even pizza. Otto’s O.F.B. is for outdoor use and can be placed on a regular garden table or grill stand. Thanks to the extricable heat shield the table surface is protected from the temperature. Otto’s O.F.B. works on propane gas that you can get in any Do-It-Yourself store. For its outstanding product design Otto‘s O.F.B. was awarded the German Design Award 2018. The perfect steak? No way. The temperature is insufficient to give your steak a perfect crust and produce ideal grilling results. At these high temperatures, your steak gets a delicious crust from the outside (Maillard reaction), while remaining tender and moist from the inside. Real heat for real meat! Pre-heating and grilling times make your stomach growl.. you will be full of sides by the time your food is ready. After only a few minutes of pre-heating, your O.F.B. is ready to use and thanks to the high temperatures your meal will be ready in a breath. Heat distribution is disturbed by dropping meat juices and fat, leading to unevenly cooked steaks. The heat comes from the top and gets distributed evenly on the meat surface, leading to perfect grill results. Little specialization, lots of mainstream. That’s not you, right? German engineering combined with elegant product design: Otto’s O.F.B. is not only a premium grill but also a true headturner. 3ft long gas hose with regulator – so that you can directly start grilling! I love my Otto Wilde grill. In, out and done. I’m always on the go and time is short. I was shocked at the results. Pat LaFrieda | America's most celebrated Butcher and Author "Meat, Everything You Need To Know"
The O.F.B. is simply the best Over-Fired Broiler. The size of its grill grate and two separately adjustable burners make it particularly versatile. Seriously: 95% of all German steak houses don’t produce such results! I am truly excited! Otto gives you a two year guarantee on all parts!